One of my favorite flowers are peonies. Growing up in Minnesota they bloomed in almost every yard in the late spring to early summer. Our elderly neighbor lady had pink peony bushes in her yard and when I was out playing and running by them I remember how wonderful they smelled. My parents always hated them because of the ants, so we never had any in our yard. What is your favorite Spring/ Summer time flower? Last summer my husband purchased a peony bush for me on clearance from a local nursery. it didn't look so hot. I did some research and found out that I couldn't plant it until the fall. All summer I water and cared for it hoping that It would make it until I could plant it in the ground. In November I planted my peony bush. I don't live where it gets extremely cold, but at night in the winter it gets down to freezing. I cover my bush and hoped it would make it through the winter. This spring I uncovered it and began watering it again. I learned from Peony's Envy that it would probably take three years for my bush to get flowers. I was a bit bummed. Then I came up with the next best thing. Peony cookies! Out of all the cookie cutters I have, I don't have a peony cookie cutter. So I looked on the internet, I didn't really find anything. Then I decided find my own peony shape. I used this shape I found for my Silhouette Portrait. I hand cut out two peonies and one stem. I used a mason jar cookie cutter for the vase. I found this Ball Jar stencil/picture that I used to create the writing on the mason jar. I use two similarly different decorating techniques on the two peonies. For the peony on the left I traced the cut out onto the cookie with food coloring marker. Then I piped over it. I used the brush embroidery technique to create dimension on each petal. After the icing dried I went in and paint some areas with food coloring to make it pop. For the peony on the right I piped and flooded the whole cookie with a very light pink. Once the icing had dried I used the cut out as a stencil and sprayed the cookie with pink Wilton's Color Mist. Then I took more of the light pink and piped it around the petals. Once again I did some brush embroidery to make the petals more realistic looking. I like the second way of decorating to achieve the two tone color that many peonies have. I think both ways of decorating worked well. I favor the one on the left a bit more. 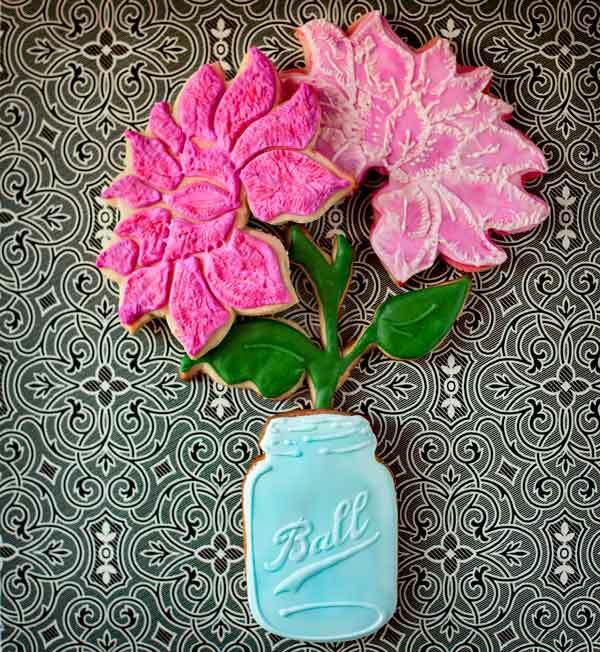 Hope these peony cookies brighten up your day!